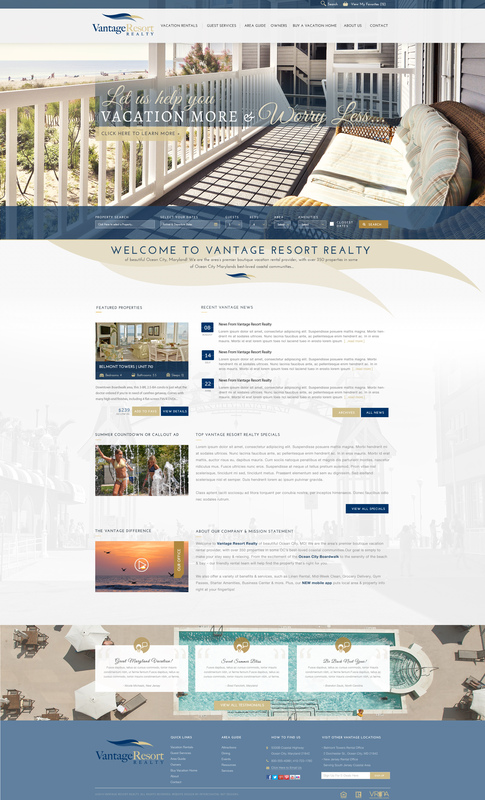 InterCoastal Net Designs (ICND) is excited to announce the launch of our newest vacation rental website, Vantage Resort Realty. Vantage Resort Realty is located in Ocean City, Maryland and prides themselves on their relationships with homeowners and guests alike. Building a new website with ICND will help their guests be able to book properties with ease, and in turn satisfy their homeowners with more bookings. The custom designed website is responsive, and built to encourage bookings. The frontend features a clean, modern design with a sticky quick search bar that remains at the top of the website no matter where you scroll. The booking portion of the website creates a sense of urgency and is designed to encourage bookings. The backend of the website allows Vantage to easily edit the information on the site and view search statistics. Check out a screen shot of the homepage of the new site below! www.VantageOceanCity.com website is extremely intuitive regarding the ways guests search. Information is laid out in a very organized way on all the pages. It is very user-friendly and utilizes the same kinds of up-to-date functions that consumers are used to in this day and age. It doesn’t just provide information, it provides a smooth experience that guests will remember and want to come back to. When I use a smooth site, it makes me want to come back to that brand again and again because I feel like they care about me and the kind of experience I have with them. It actually elevates the Vantage brand and makes us look good! It enables us to provide a high-end experience with the guest from their first interaction until check-out day. The fully responsive/mobile version is a huge upgrade for us, as well — it’s very responsive and fast. My personal favorite is the way the information is laid out on the individual property pages — love that you can see daily and weekly rates at the same time as the minimum night’s requirement. As a property manager who also wants to please our owners, I expect that our owners will agree that the property pages really organize the property info well and make their homes shine. Our site is going to make THEM look good, too, and we all know that property owners are judging websites as they shop VRM’s. On the customer service side, ICND worked hard to customize things in every nit-picky way that we asked them to. Their team was very accommodating, responded quickly — seemed like we had their full attention and effort. And a lot of the features we thought would cost extra or would be difficult to implement came as part of their standard design. Lots of little bonus features that we weren’t even expecting, such as Split Cost Calculator and ability for guests to post questions directly on the site (as Amazon and other big sites do, too). Which will showcase information and allow for bookings of specific larger resorts in Ocean City, Maryland. ICND will also be working with Vantage on Search Engine Optimization (SEO) and Pay Per Click Advertising (PPC) to help make 2015 their best year yet!